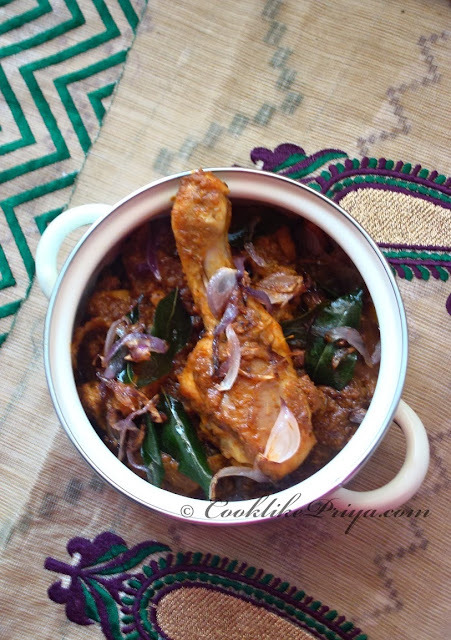 My love for Chicken has no limits :-) every fortnight we have a dish with Chicken and trust me I usually love make Chicken Masala / Thokku rather than a plain Chicken Curry. 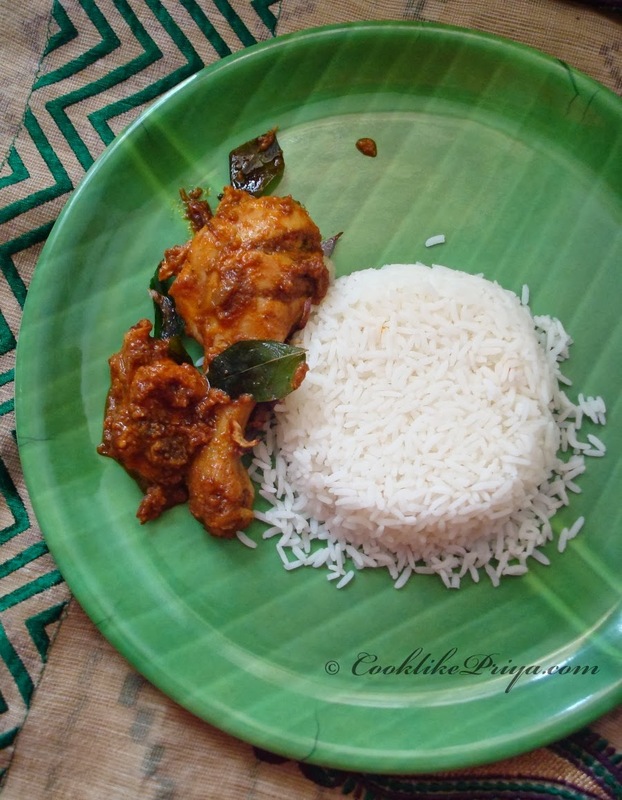 This Kerala Chicken Roast is a family favourite and is great as a side for white rice / appam/ dosa / idly. I would call this a quick marination recipe and also one that is slow cooked to get its flavours. So make sure you take time to do this curry but I promise it tastes better than it looks :P. I had to serve husband his lunch and then click pictures and hence I could not do much justice with the captures. Kerala Chicken Roast is marinated with spices and floured, fried to hold its flavours and then cooked with a masala/ thokku in a slow flame to develop flavours. Its a great and satisfying side to any main and is not very spicy in my opinion. You can adjust the spices according to your taste and liking but do follow the same method of cooking for a great tasting Chicken Roast. Wash the chicken well with water for 2-3 times, let the excess water drain from a colander. Once its dry add all the ingredients mentioned under to marinate and give a good mix, close with a lid and set aside for 1 hour. Once all the chicken pieces are fried using a slotted spoon drain the chicken pieces and set aside. In the same pan add half of the fried onions and curry leaves, add the pureed tomato and add fennel powder, kashmiri red chilli and keep on low flame and roast this until oil separates This should take 3-4 minutes. Now add the fried chicken and give it a good mix, add one cup water and cook with a coverd lid for 15 minutes further until all the flavours mingle and oil separates. - Slow cooking is the key to this curry so don't do it in a hurry. - Make sure the chicken is dry while adding the marinate powders. My husband will complete it if you show him this bowl. We make it slightly different but I like the addition of rice flour and more of fennel.That should make the gravy yum..The leg piece served with rice is tempting me Priya. I swear I am salivating. Delicious. Lovely clicks,. it looks so yumm priya.....wanna have it..
wow...lovely...wish to pick it up from the screen!! This looks so good... I love the 2nd pic because it has made me really hungry at 8.30am in the morn. Looks so good! Am just drooling over that leg pieces, colour of the dish is just mindblowing. love d 2nd clik n perfectly cooked n clicked.